Students at the LaunchLab pitched their two-minute ideas on how they can help move West Virginia Forward by identifying a problem and solution based on WV Forward's blueprint on September 6, 2018. In addition to the pop-up pitches, current LaunchLab clients demonstrated their ideas and innovations to the crowd. This first event of the year gave participants and spectators a better understanding the resources, connections and successes that the LaunchLab offers. The pop-up pitch competition’s winner was determined by hand-picked judge, John Williams, who serves as a Staff Attorney for the Entrepreneurship and Innovation Law Clinic at the West Virginia University College of Law. Emma Hartle, a senior in the Davis College of Agriculture, Natural Resources and Design, pitched her idea on turning brownfields sites into agricultural educational facilities, partnering with local communities and after school programs to teach students how to produce food and learn about livestock while repurposing the land. The audience had the opportunity to vote for their favorite present client. 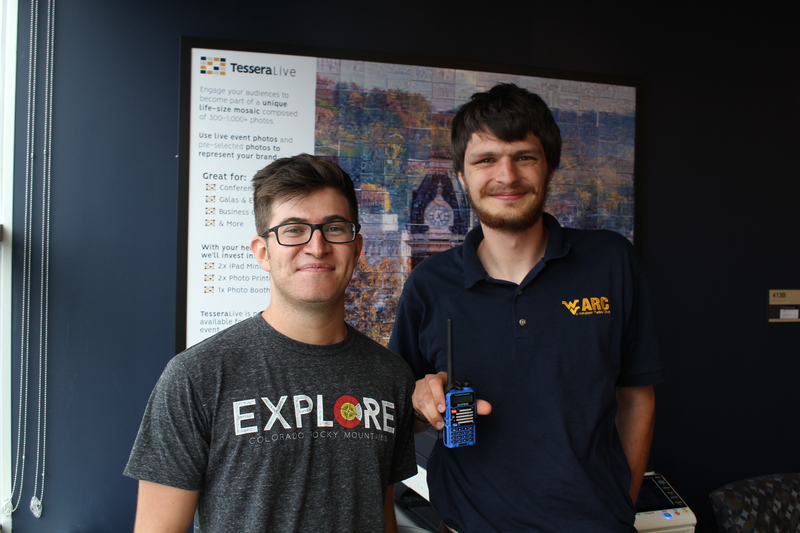 Will Howard and Adam Roh, students in the Benjamin M. Statler College of Engineering and Mineral Resources, showcased their innovative mobile communications trailer, which provides radio wave access in dead zone areas across the state. They attend events to ensure safety communications when cell service is unavailable. This is the first of four pitch competitions to be hosted by the LaunchLab Network this semester. In addition to helping students develop their ideas, inventions and business strategies, these on-campus competitions help prepare them for national competitions hosted by prominent business schools and corporations in which the judges are real potential investors. Operating since 2014, West Virginia University’s LaunchLab Network serves as a comprehensive, one-stop shop to help students develop and commercialize their ideas, innovations, inventions or business models. In a motivating and supportive environment, the LaunchLab Network is an applied innovation center offers hands-on idea development support, education, mentorship, prototyping facilities, resources and connections to empower entrepreneurs across West Virginia. The LaunchLab Network is a part of the IDEA Hub ecosystem. West Virginia Forward is a statewide effort to help uncover the best solutions to help advance the state’s economic future, following an independent blueprint of recommendations and ideas that can leverage growth and development opportunities to strengthen and diversify all regions of the state. To learn more about West Virginia Forward, visit https://wvforward.wvu.edu/. Will Howard and Adam Roh students in the Benjamin M. Statler College of Engineering and Mineral Resources, won best demonstration at the Welcome Back Pitch and Showcase competition on September 6, 2018. 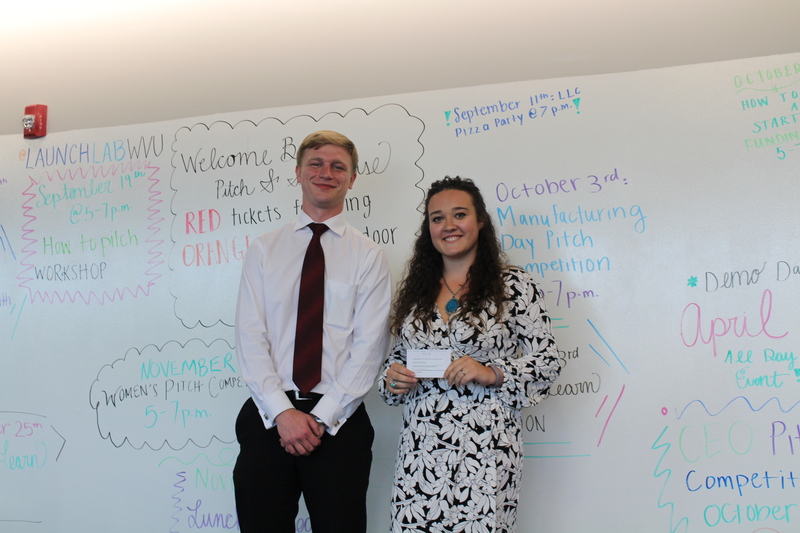 John Williams, the judge of the Welcome Back Pitch and Showcase competition, poses with Emma Hartle, winner of the pop-up pitch competition on September 6, 2018.